Here is a round ripple i made for my 10yr old DD the pic was when it was almost done it is finished now but she won't let me have it back to take another pic I will try to update one monday when she is in school lol. I've yet to make a round ripple...but it's next on my list. 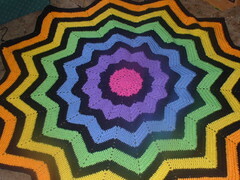 Love the colorful round ripple....I haven't done afghans in years...would love to try this, is there a pattern? Great job on all the items on your blog.